"A friend gave me this recipe a couple years ago and it is simply delicious! 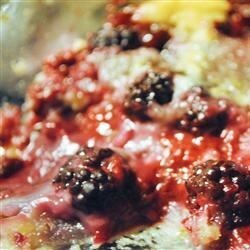 A quick, no-fuss cobbler that is sure to please your taste buds!" Place butter into the bottom of a 9x13-inch baking dish and place in the oven until butter is melted, about 5 minutes. Whisk flour, sugar, milk, and baking powder into a smooth batter in a bowl. Pour batter over melted butter without stirring. Mix blackberries with blackberry jam in a separate bowl and spoon blackberries and any accumulated juice evenly over the batter. Bake in the preheated oven until blackberries are bubbling and cobbler is set, about 1 hour. Tasty, but in a 9x13 pan there is no way this takes an hour to bake! Granted I had to use canned blackberries today, but it was golden brown and DONE in 30 min. It's a keeper recipe, though!